Elizabeth Arden Statement Brow - $32 - in Blonde, Honey, Brown and Dark Brown - an all-in-one tinted gel that grooms, conditions, fills and shapes, making it easy to create a defined, smudge-proof look with up to 12 hours wear. Featuring a unique, precision bristled brush and enhanced formula containing beeswax and carnauba - helps to define and hold brows in place for long-lasting wear; kaolin - a natural clay that provides texture to give brows shape and a fuller appearance; mineral pigments and pearls - to naturally fill brows and reflect light to create subtle shine and dimension; shea butter and rapeseed oil - provide moisturizing and conditioning properties, as well as antioxidant protection; and silk and panthnol - rich with vitamin B5 and amino acids to help nourish and condition the brow hair - allowing for effortless application to hold brows in place all day. Available now at Hudson's Bay, London Drugs and Shoppers Drug Mart stores across Canada. 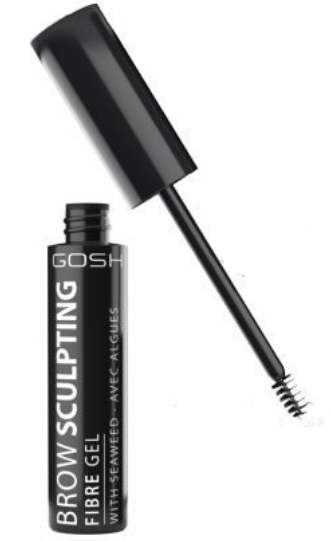 GOSH Brow Sculpting Fibre Gel - $17 - in Nutmeg and Chestnut - with a long-lasting gel formula to tame brows and hold them in place all day while easily adding volume with fibres that build up the brow, colour to fill in bare spots while nourishing with bladderwrack seaweed which contains ultra-high levels of antioxidants, amino acids, vitamins and minerals - applied with a tapered brush for precise application. Annabelle Brow Show Shaping Gel - $8.95 - in 2 universal shades: Light/Medium and Medium/Dark - to define and fix brows in one easy step for natural and uniform hold.